An engraved frame is one of those gifts you can give for any occasion! Whether you are celebrating a birthday, wedding, anniversary, retirement, graduation, or a new puppy, we have a frame that will suit the occasion and the photo. These photo frame have a black painted border which we laser etch to give a beautiful etched frosted glass personalization. They come in 4x6 and 5x7. 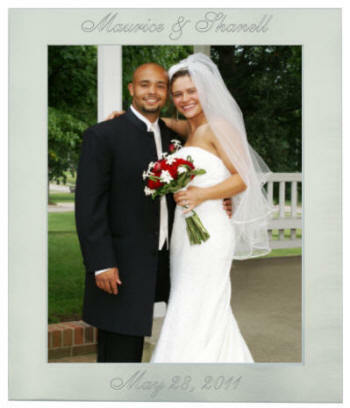 This 4x6 engraved satin finish aluminum picture frames and can be engraved above and below the picture as desired and can be oriented vertically or horizontally in the lettering style of your choice. We show this frame engraved with 'Daddy's Little Girl', but we can engrave this frame for you with any saying you would like. Other suggested saying are 'My Mom and Me', Mom's Pride and Joy. 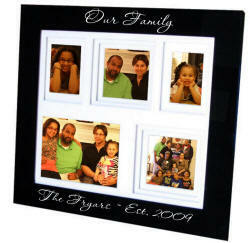 Frames can be engraved horizontally or vertically. 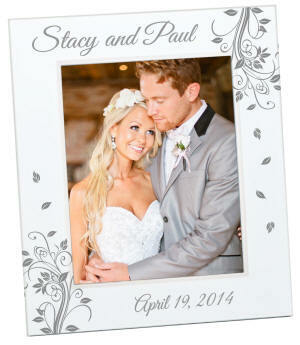 This very pretty white photo frame holds a 5x7 photo. It laser engraves to the silver metal underneath making a beautiful white/silver contrast for the personalization. We can personalized with or without the scroll design either portrait or landscaped as the frame can be used either way. Flocked back with built in flock stand. 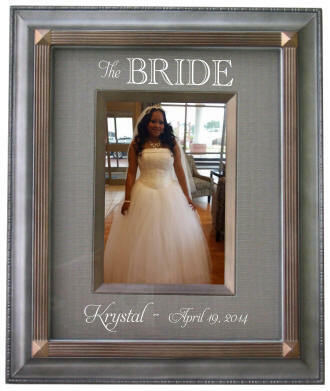 This mirror finish rectangular picture frame holds 1 3x5 photo. We engrave it with the "He Asked.." inscription along with the couples names and engagement date. The multi layered mats give added dimension to the frame and really make the photographs inside stand out. Imagine this filled with pictures of your wedding, graduation, pictures of a newborn, or perhaps all your grandchildren.